Our product, PM Batch Cleaner is an add-on designed to enhance Microsoft Dynamics GP. With PM Batch Cleaner you can quickly display all transactions in a payables batch, then sort and filter them for easy modification or deletion. 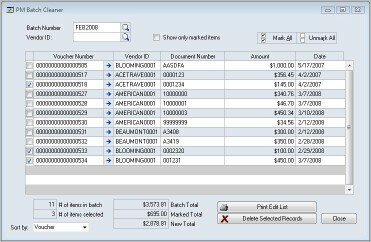 Reports run to see all items marked for deletion, and all items after they have been deleted including totals. These capabilities allow you to avoid tedious voucher deletions, one screen at a time. Also, it organizes all transactions visually to make distribution changes easier should they be required. Learn more about PM Batch Cleaner or our other products by contacting us today. We can arrange a demo or offer a trial version of our product. We look forward to hearing from you! Call us at (412) 877-7114 or complete our online form for more information. Copyright © 2018 Iceburgh Solutions, LLC. All Rights Reserved.